YOSEMITE and his ET full brother YELLOWSTONE represent the newest generation of sons of our prolific donor dam, MAC LIL BLOSSOM 35L. 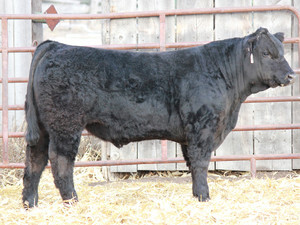 YOSEMITE is a powerfully designed and eye-catching bull who is quickly spotted by most looking through the bull pen. He has a wide top and big rear end and packs the pounds on from end to end of his lengthy frame. His dam now has over 25 progeny in the registry and has been a consistent producing donor dam for us. She is a typical MASTERPIECE daughter - very feminine and easy fleshing with lots of volume, capacity, performance and superb udder quality. She almost always adds an extra dimension of eye appeal to her progeny as well. Average birth weight on her 26 natural and ET calves is 83 pounds with an average adjusted 205 of 632.